Most Scouts have at least one sleeping bag stored in their closet. Unfortunately, some of these old sleeping bags are bulky, heavy, made of cotton, and do not provide much insulation for cold high-altitude sleeping. Heavy cotton bags are completely unsuitable for backpacking and should be left at home for your next sleep-over at a buddy’s house. There are many good sleeping bags available for backpackers – from a variety of sources like REI, Amazon.com, and even Target or Sears. Like all backpacking equipment, there are significant trade-offs between weight and comfort. However, recent advances in sleeping bag technology and construction make it possible to get what you need without paying the exorbitant prices of just a few years ago. Sleeping bags need to fit inside your stuff sack, which must also fit into your backpack. So size or bulk is a significant consideration. A stuff sack with your sleeping bag inside should not be larger than a big watermelon. The smallest bag in a stuff sack may be about the same size as a basketball. 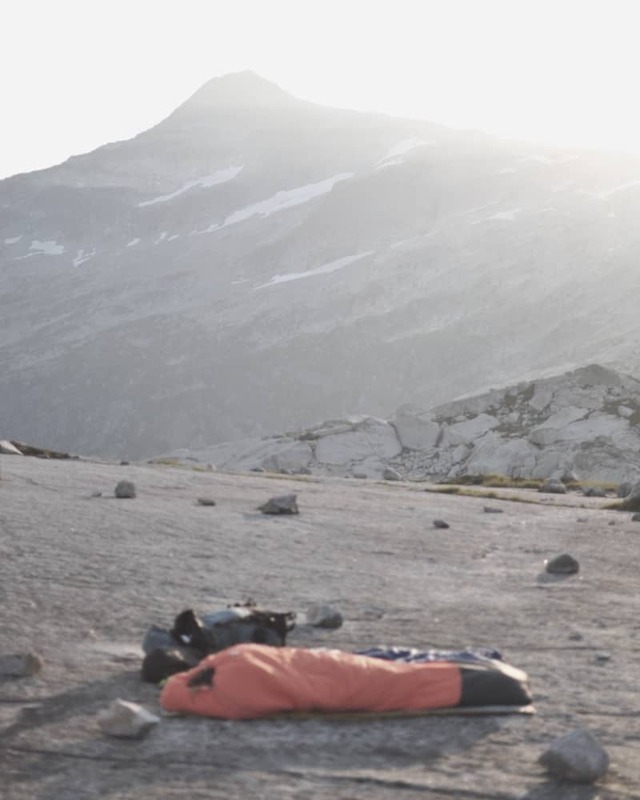 For some Ultralight backpackers, weight overrides all other concerns (warmth, comfort, durability, price) and they sometimes carry a blanket or quilt instead of a sleeping bag. For others, weight is less important than having a warm and roomy bag for a comfortable night’s sleep. A backpacker’s sleeping bag should not weigh more than three and a half pounds. Keeping your weight down while backpacking doesn’t necessarily mean forgoing any and all luxuries. Consider taking a lightweight backpacking chair on your next trip, to help take the weight off your feet at the end of the day – without adding much weight to your pack. Most backpacking bags are mummy-shaped because they retain heat more efficiently. However, some hikers get claustrophobic in mummy bags and opt for roomier tapered bags that are rectangular in shape. Square bags are not as warm as mummy bags. There are two main types of sleeping bag fill or insulation: down and synthetic. Down is generally lighter and more stuffable, but takes more care and is more expensive. Goose or Duck-down fills are very light, compressible, durable, breathable, and expensive. However, untreated down bags absorb moisture and don’t dry easily. So if a young hiker gets his bag wet somehow (like exposing it to rain or condensation) it will likely stay wet for the rest of the trip. Wet untreated down is useless as insulation. However, newer dri-treated duck down bags are acceptable. Synthetic fills (usually some kind of polyester) are less expensive, non-allergenic, and provide some warmth even if they get wet. Synthetic bags are slightly heavier and less compressible than goose down, but do almost as good a job of trapping body heat. However, synthetic bags lose some of their insulating power every time they get stuffed into a sack – especially a compression stuff sack. So, if both are equally maintained, a ten-year-old synthetic bag will not be as effective at insulating your body as a ten-year-old down sleeping bag. Choose a bag rated for the coldest temperature you expect to encounter. The new European Norm (EN) standard, described below, is highly accurate. Hikers who have sleeping bags that do not keep them warm at night can also purchase a bag liner to increase the insulation of their current sleeping bag while saving up for something better – and more expensive. The temperature rating for sleeping bags is supposed to provide a guideline for comfort in various weather conditions. Zero degree bags presumably are comfortable in zero degrees Fahrenheit weather and 40-degree bags keep you warm enough if the temperature only drops to 40 degrees. However, since every sleeping bag manufacturer does their own testing with their own methodology, the temperature ratings on sleeping bags are neither consistent nor especially accurate. 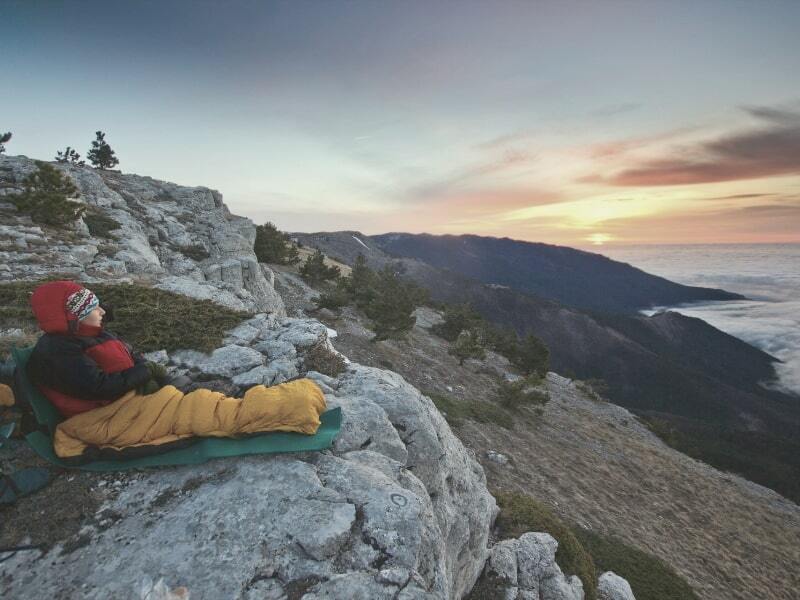 Over the past decade, large retailers like REI have pressured sleeping bag manufacturers to test their bags using the European Norm (EN) 13537 testing methodology. EN testing is done by independent labs using mannequins, volunteers, heaters, temperature sensors, and climate controlled chambers. Temperature ranges are described, from comfortable to survival and bags are measured against these descriptions. Different ratings are provided for men and women to reflect their different metabolisms. When purchasing a bag, compare the EN or traditional rating to the type of backpacking you plan on doing (and the temperatures you might have to endure) and purchase accordingly. Winter or snow camping trips require something like ten to thirty-degree bags, but you can probably take a 40-degree bag on a summer outing. Most beginning backpackers should purchase a bag that keeps them reasonably warm if the temperature drops to 30 degrees at night. 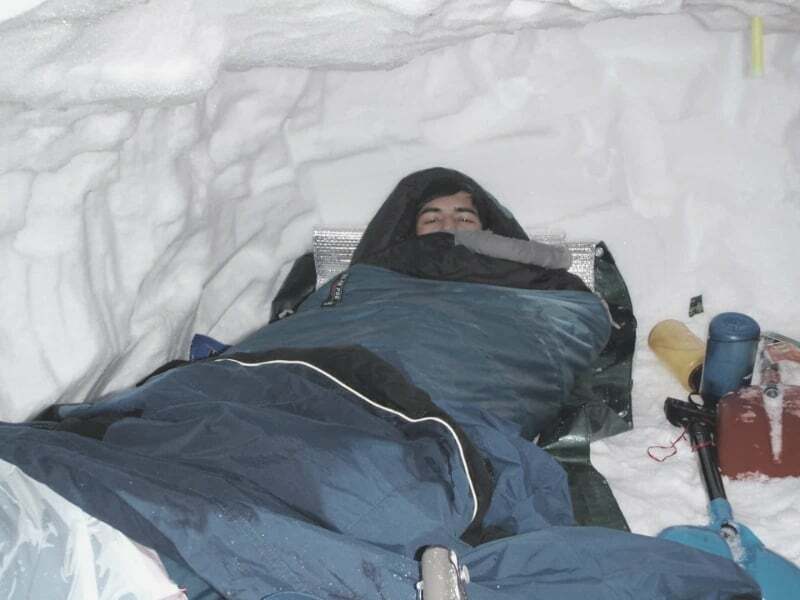 If it gets colder than that, a sleeping bag liner can be used to provide added warmth. Plastic zippers are recommended over standard metal zippers; the large zippers work best. Two-way zippers (can be opened from either end) allow ventilation of the foot-end of the bag without completely unzipping the bag. While hiking, the sleeping bag should be carried at the bottom of the backpack in a waterproof or garbage bag lined stuff-sack to keep it dry. At least 30 minutes before turning in for the night, fluff up the sleeping bag to give the insulation time to loft. Sleeping bags usually should not be stored in the stuff-sack at home because this will mat the filling, causing a reduction in loft, and thus warmth. Bags are best stored in “cloth storage bags” or left lying or hanging as loose as possible. Compression stuff-sacks are not recommended because they sometimes over compress and damage the filling material. Sleeping in all your clothes is usually a bad idea. Not only will you get the inside of your sleeping bag dirty, but you might actually be colder than if you stripped off a layer or two. Modern sleeping bags are designed to capture body heat inside the bag. If you wear so many layers that body heat does not escape your clothes then the sleeping bag insulation cannot do its job. Plus you will likely sweat during the night which might chill your body even more. Build yourself a Sleeping System to get the rest you need. Besides the sleeping bag, the following factors influence your warmth and comfort during the night. Sleeping Pads protect against conductive heat loss as well as adding cushioning and comfort. There are two types of sleeping pads: closed cell pads (lighter and more durable) and self-inflating pads (heavier and more comfortable). Shorter closed cell pads can be purchased for boys (or longer pads can be trimmed down) to reduce weight and bulk. Most boys should have closed cell pads, at least in the beginning. Trail Tip: Purchase a synthetic sleeping bag that weighs no more than three pounds with a temperature rating of 30 degrees Fahrenheit or less. Usually, the more you pay, the lighter the sleeping bag, but the cost is always more important in the store and less important on a very cold night. Sleeping Bags that weigh no more than 3 pounds and are rated at 30 degrees temperature or less will be fine for most backpacking trips. Sleeping Bag Liners are available in a variety of fabrics and styles. Silk liners are very light and provide some insulation for a few ounces of weight. Other fabrics can provide up to 25 degrees of additional warmth for a few ounces more. Often, a good liner can turn your current sleeping bag into a “toasty oven” for a lot less money than purchasing a new sleeping. Pillows can be assembled by filing the sleeping bag stuff sack with extra clothes, camp towels and fleece sweatshirts. Lightweight backpacking pillows can also be purchased at larger sporting good stores. 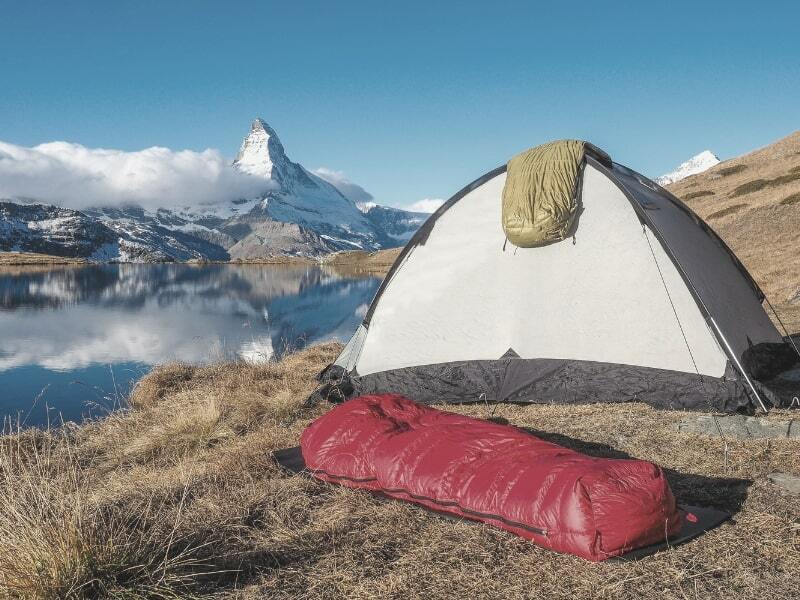 Backpacking tents provide some insulation might be up to 8-10°F warmer than the air outside. When you are really worried about being cold overnight, wear just long underwear, shirt, socks, and knit cap. Put all your extra clothes into your sleeping bag – or under it. Being hydrated and eating small snacks (chocolate) at night will also help keep you warm. PrevPreviousAre Down Bags Really So Dangerous?